A strain or a pulled muscle can be defined as an injury to a muscle or a similar soft part by using that part too much. This normally results from persistent use of part of a body, fatigue or using a muscle the wrong way. Strains can occur in any muscle but the most pronounced body parts are, thigh muscles usually known as hamstring, neck, shoulder and lower back. On the other hand, a sprain refers to an injury to a tendon whereby there is tearing of the muscles as a result of over straining. Usually a strain will cause pain and even limit one’s movement within the affected muscle area. Mild strains are easily treated at home using, medications which are ant-inflammatory, heat and ice. Severe case of strains or tears should be referred to a medical practitioner. Common signs of a strain include discoloration around the strained muscle and localized stiffness, feel of pain when resting. Also, loss of strength and range of motion can be a helpful symptom. The first treatment for a strain includes five steps discussed below. Icing the injured part reduces blood flow to that part thus reducing swelling. Take caution never to ice for more than 20 min at a time. This is keeping the strained part to the heart’s level so as to keep blood from pooling in the area injured. 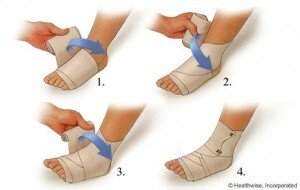 Cold compression therapy will ease swelling and pain as the injured part begins to heal. Inflammation control is crucial to the healing process whereas icing will restrict leaking of fluid to the injured part and controlling pain. Immediate treatment is normally accompanied by ant-inflammatory drugs which relief pain and reduce immediate inflammation as well. However, drugs like ibuprofen and aspirin should never be used because they affect platelet function and will definitely increase blood-flow thus leading to swelling and bleeding. It is advisable that the injured person seek medical attention in case severe pain accompanies the injury and if there is noticeable tenderness over the isolated spot. This can be a sign of a complete muscle tear, a sprain, broken or fractured bone. Finally, use of therapeutic ultrasound can help to break down muscle strains that are poorly healed and permit them to heal properly.